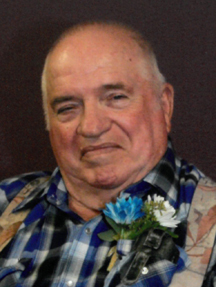 Dale Myron Thompson passed away peacefully at Perham Living under the care of Hospice of the Red River Valley with family members present on March 30, 2019 at the age of 75. Dale was born on December 15, 1943 in Perham, MN to Russell and Esther (Jabs) Thompson. He graduated from New York Mills High School in 1961. He served in the Army National Guard from 1961 until 1966. On September 2, 1967 he married Sharon Dora Fiedler at St. John’s Lutheran, Corliss and they were blessed with 3 children. Dale is a lifetime member of Trinity Church. For 30 years as owner of Dale’s Trucking, he made a career of driving semi traveling the Midwest, hauling cattle, lumber, steel and general freight. When a stroke caused his early retirement in 2006, he changed his focus to spending more time with family and friends. His grandchildren held a very special place in his heart. He also enjoyed watching old western movies, reading Louie Lamoure books, and working in his woodshop. He is preceded in death by his parents Russell and Esther Thompson, 2 brothers Wayne and Eldor Thompson and a great-grandchild Dante Thompson. Dale is survived by his wife of 51 years, Sharon, his 3 children, Lisa (Pete) Santiago of Fargo, ND; Michelle (Terry) Frost of New York Mills, MN; and Chet (Dani) Thompson of Williston, ND; his 7 grandchildren, Damian (Brittany) Thompson, DeSean Thompson, Zachary Frost, Annika Frost, Keaton Wehrman, Maya Thompson, Ryley Wehrman; and 2 great-grandchildren, Harmonee and Jaxon Thompson; his 2 brothers and 2 sisters, Arlo (Joyce) Thompson of New York Mills, MN; DeLaine (Jerome) Meyer of Perham, MN; Sandy (Arlo) Brasel of St. Cloud, MN and Scott (Melody) Thompson of Wadena, MN; several nieces, nephews, other relatives and a host of friends. The family would like to thank Perham Living and Hospice of the Red River Valley staff for their care and support.